In a story so typical of some of Germany's finest soldiers during the Second World War, Admiral Dönitz attempted to persuade Prien to transfer to a training unit, but the man beloved by the German people as their ace in the pack refused, preferring instead to return to the danger of the cold North Atlantic. Refreshed after much welcome rest and with his boat refitted, Prien set out on his and U-47's tenth patrol on February 20th 1941. 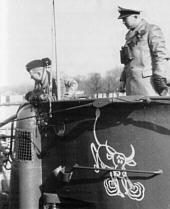 Left: Günther Prien prior to setting off on what would be his and U-47's final mission, clearly showing the signs of age after nine gruelling patrols. Right: Prien stands on the conning tower. Making its way to the west coast of Ireland, U-47 encountered the outbound convoy OB-290 on 25 February. 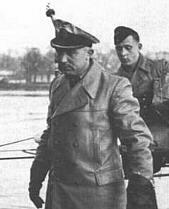 Following Prien's report, Dönitz ordered for reinforcements, but when these failed to arrive in time the skipper of U-47 decided to take on the convoy alone. His first victim was the Belgian freighter Kosongo, which was struck by a torpedo just after midnight on the 26th. This was quickly followed by a hit on the British tanker Diala which damaged the 8,100 ton vessel. Within the hour, Prien had reloaded and had set about claiming his second and third victims of the day, the Swedish freighter M/S Rydboholm and the Norwegian freighter Borglund. U-47's key role in the slaughter of Convoy OB-290 did not stop there: acting as a beacon, the boat successfully guided the dangerous Condor bombers towards the procession of slow-moving vessels. In a concerted aerial attack, a squadron of six Condors sunk seven of the merchantmen and damaged an eighth. On 28 February U-47 came upon a straggler from the stricken convoy, the British steamer Holmelea, which was quickly despatched with 88mm gunfire. The steamer was U-47's fourth victim of its tenth patrol, and the thirtieth in all since the beginning of the war. Things were to get better on the following day when Prien received the news that he had been promoted to the rank of Korvettenkapitän. U-47's was to wait over a week for its next encounter, when it came upon the 20,638-ton British whaler Terje Viken, part of outbound convoy OB-293 on 7 March. Two torpedoes were fired at the whaler, both registering successful hits. Not long after launching this attack, Prien found himself among a pack of at least four enemy destroyers, among which was the Wolverine, commanded by Commander James Rowland. Schepke - Kretschmer - Prien. What has become of these three officers, the most famous German U-boat commanders, the only ones on whom Hitler has bestowed the Oak Leaves Cluster to the Knight's Cross? Schepke is dead. German High Command had to admit it. Kretschmer is captured. German High Command had to admit it. And Prien? Who has heard anything of Prien recently? What does German High Command have to say about Prien? Where is Prien? 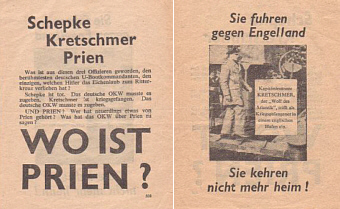 The decision to keep the loss of the Kriegsmarine's most popular U-boat commander away from the German public in all probability did more harm than good; questions were being asked, and following the dropping of the "Wo ist Prien" leaflet the Nazi propaganda machine had probably got itself into a fix it could very easily have avoided. The lack of news about Prien generated all sorts of fantastic gossip - including once rather incredible story about his turning anti-Nazi and ending up behind the wire of a concentration camp. The flyer dropped by the British over German after U-47's disappearance, and before his death had been announced to the German public. The illustrated side of the flyer says: "They sailed against England... They are not coming home". Like many other aces during the war, the destruction of U-47 has for a long time been a subject of debate among naval historians. Of all the case scenarios that have been postulated, the most likely is that the U-boat had been subjected to depth-charge attack by both the Wolverine and another destroyer, Verity, although no concrete evidence was or has ever been produced to confirm this. Other equally feasible explanations include crew error, structural failure or that the submarine might have been hit by a stray torpedo, possibly one of its own. Of course, this is all pointless in the clear light of war. What is clear is that Korvettenkapitän Prien failed to report to headquarters after March 7th, and that U-47 and its crew were never to be seen again. The loss of Günther Prien and his fellow U-boat aces during the course of March 1941 precipitated the beginning of the end for the much-vaunted German U-boat fleet; the issue of morale had been set at such a high premium that Prien's death was not even officially announced until 23 May 1941 - over two months after U-47 had been reported missing in the cold expanse of the North Atlantic. Although there would be many more aces produced by the U-boat arm during the course of the remainder of the war, none of them were to reach the high standards reached by the first group of sea-hunters; the beating heart had been torn out of Dönitz's fleet, and by the middle of 1941 the Allies were on top of the situation in the North Atlantic, a situation that was never to reverse. The hunters had, by this time, become the hunted.